This denim jacket is provided from an custom selection provided by G-Gator as it is a "Made-To-Order" jacket. Prior to shipping this jacket to you, we will inspect the jacket for quality purposes. Please, allow an additional 3-4 weeks to receive your jackit from the manufacturer as it has to be specially made. Please note color swatches may vary from actual production color due to your monitor settings. CREATE YOUR OWN UNIQUE, CUSTOM-MADE JACKET BY SELECTING THE APPROPRIATE COLOR COMBINATION AND SIZE ABOVE! As seen on TV and in magazines, Upscale Menswear is proud to present this exclusive, custom made, exceptional quality genuine hornback alligator denim jacket. Theis relaxed jacket is handmade by one of the finest exotic skin jacket manufacturers, G-Gator. 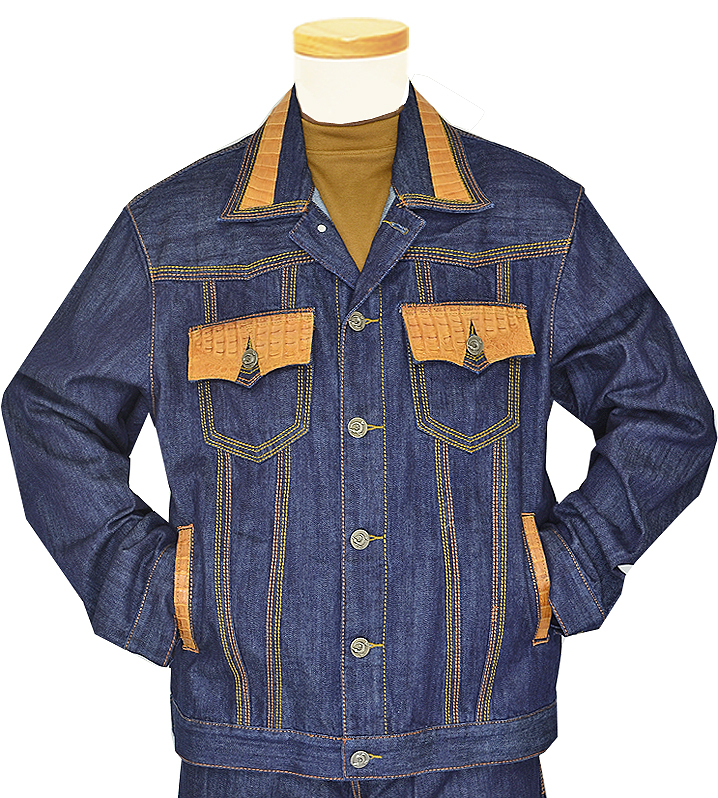 G-Gator offers sensational hornback alligator denim jacket that is completely hand crafted and hand stitched in the USA. The exterior is made of genuine hornback alligator and raw denim. The G-Gator's Custom Hornback Alligator Collection doesn't use the "painted-on" process to color this outfit like other manufacturers; instead, they use a special aniline process to dye the premium grade hornback alligator that the selected color permeates the skins thoroughly. The skins maintain its color for a lifetime and becomes more beautiful with age. 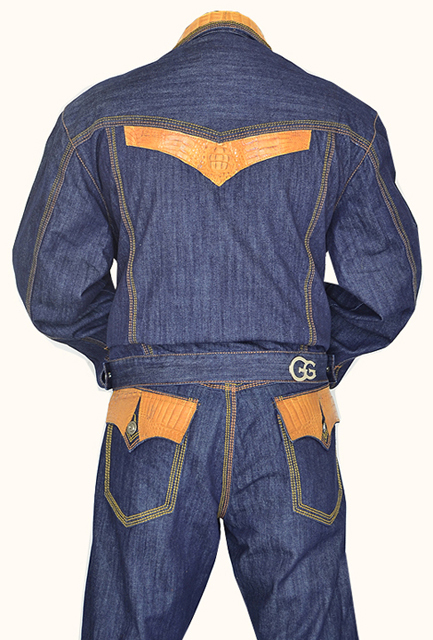 G-Gator utilizes more classically defined details using the highest quality denim, aimed at the high-end consumer. This hand-tailored jacket would go perfect with nice matching jeans, click here to view the matching jeans. G-Gator's main focus is quality and main direction is aggressive high-profile fashion menswear. From television to music videos to recording artists, the G-Gator brand has been seen all over the world. Because this outfit can be custom made according to any color you pick, you will be the only one with this one-of-a-kind head-turning outfit on!